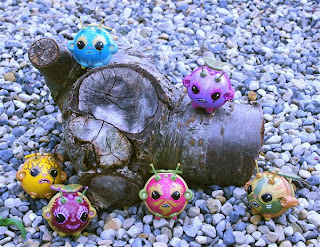 Lunabee: custom vinyl toy art: Robobees and an exciting new line..
Robobees and an exciting new line.. Thanks so much to all who bought a Robobee! These gorgeous little bees were beautifully cast in resin by my close friend and super talented artist Cris Rose and then lovingly painted up by me. Series 2 will be hitting the store in May, keep your eyes peeled! In other news, I am adding a brand new line to the Lunabee store which I am so very excited about! I will be talking about it in the Lunabee newsletter first so if you wanna be ahead of the game sign up by dropping me an email : lunabee at miskellaneous dot co dot uk!